Inventory We are a resale marketplace, not a box office or venue. Ticket prices may exceed face value. This site is not owned by Swiftel Center . The Swiftel Center is multi purpose facility that provides many different entertainment options for the Brookings, South Dakota population. 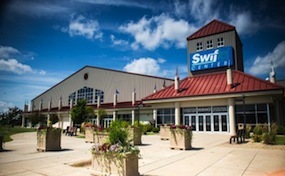 The Swiftel Center arena has a seating capacity of 6,500 and can hold all major events from concerts to traveling family shows. The Swiftel Center box office is located at 824 32nd Avenue in downtown Brookings South Dakota. CenterBrookings.com is an independently owned and operated site that concentrates solely in the online retail of all events in the secondary ticket market. We are not currently associated with any primary venue, box office, or official website. Prices on our sites may be below or above face value and can change quickly with demand. To order tickets for all Swiftel Center Brookings South Dakota events simply follow the steps online through the checkout or call our operators at anytime.